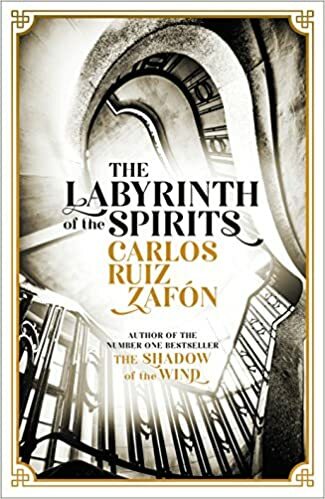 I received my review copy of The Labyrinth of the Spirits by Carlos Ruiz Zafon with joy and trepidation. Joy because the first book in this cycle, The Shadow of the Wind, remains one of my favourite books. Trepidation because this fourth book has been on the cards for a long time and the second and third books did not work as well as the first for me. Once again we are mainly in Barcelona and it features some of the characters from the earlier books as well as books mentioned in the other books! In the main it is set in the same era as the other books too, the era of the Civil War and Franco’s rule. The start was evocative and very much in keeping with the earlier books. The Civil war rages and it’s Fermin’s story (& an unwelcome but unsurprising return for Fumero). Fermin has always been a favourite character of mine and to have some background sketched in was good. It also managed to introduce a new favourite character Alicia (I am fairly sure she did not appear in the earlier books though it is a while since I read them). The language is so good, richly descriptive and poetic. It conjures up rich images, dark and gothic at times. The interweaving of the previous books is very clever. I often understood that I’d seen this part of the story before but from a different angle. To do that over 4 books does suggest the writing is of a very high order. There are time shifts but they are well enough signposted. I enjoyed meeting old friends again and discovering some new ones. As I said Alicia particularly is a great character and her co-worker Vargas was very good too. Even the more minor characters are often very rich. Zafon manages to bring some light into very dark places via some nice humour from Fermin and others. The book overall is both wide ranging and quite long. Some may find this an issue however it is not a book to be rushed. That said I was left with a slight feeling that the book could have ended earlier and just as satisfactorily. I’m fairly sure that I recall the author saying in the first book in this cycle that they could be read in any order. For me that applied to the first three and I have reread them in differing orders. However I do think this last book should probably be treated as just that – the last book. Things are revealed in The Labyrinth of the Spirits that I’m fairly sure would change the impact of any of the other ones if read before them. The Shadow of the Wind is without doubt my favourite of the cycle however this would definitely be the second. I think fans of the Cemetery of Forgotten Books cycle should find it satisfying. Maybe not quite a 5 but 4.5 happily.